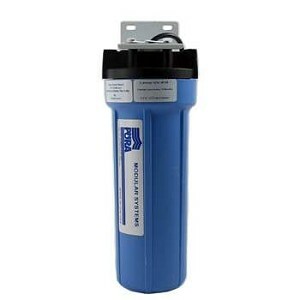 Filter Cartridge Replacement: EPCB 0.5 Micron or EPCB 10.0 Micron. The Pura UV-1 EPCB is a unique unit that consists of a single slimline housing that holds a UV lamp inside Pura s exclusive extended pass 1/2 micron carbon block filter. It s a great single-pass treatment for removal of bacteria and cysts as well as chemical contaminants. The UV-1EPCB unit (above) is available in a single-canister format only. It treats up to one gallon-per-minute, removes cysts (with the optional 0.5 micron filter), and provides excellent chemical reduction.